Thank you for your interest in hosting an Ed Dabney clinic. We would be happy to come to your location and present our Horsemanship Clinic. Ed’s teaching style is very clear and straight-forward, giving students a systematic approach which is easy for both horse and rider to understand and apply. Ed’s gentle methods have been proven effective by successfully working with hundreds of horses and humans. 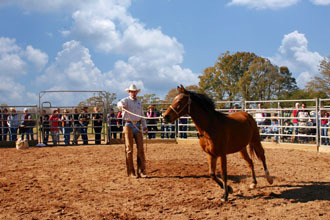 Participants and spectators will learn problem solving principles and teaching techniques that work with the horse's nature and instincts in order to overcome resistances with confidence, patience and understanding. Our clinics are applicable to any riding discipline - English or Western, show or pleasure. Participants will develop a better relationship with their horse- lighter responses, more respect, trust, and harmony. They will understand how their horse perceives the ideas presented to him and how to communicate with him in the way he communicates with other horses. This is all accomplished with respect for the horse by using gentle, natural horsemanship techniques. Beginners as well as advanced riders have found the skills taught in our clinics and lessons to be very useful. Ed’s system of working with horses builds confidence in handling horses on the ground and mounted, equips owners with natural communication skills and establishes their authority as a confident, consistent leader for their horse. Our clinic will provide a good benefit for the facilities' present boarders and students as well as bring new visitors to the facility. Our web site features color flyers which you can download and customize for your clinic date and location. These professionally designed flyers could be posted in your area tack and feed stores to bring more visibility to your facility. We guarantee participants will definitely get their money's worth of knowledge and skill development for the weekend. Throughout the weekend Ed teaches non-stop and convey as much information as the participants can absorb. Along with addressing the group, Ed also spends personal time with each participant answering their questions and helping with their particular issues. Thirty years of working with horses in the ranching, motion picture and training industries along with my formal training in 17th century classical equitation provide me with a very unique and broad basis of skills and knowledge to pass on to clinic participants. They'll learn gentle horsemanship and classical riding techniques that you've never seen before and that are not taught at any other clinic. clinic hosts have made a profit when hosting our clinics. Please contact us if you wish to discuss more details. The clinic and lessons were so great! I was impressed with your magnificient touch with the horses and your teaching skills. I feel the relation between me and my horse is getting better every day. I hope you had a good journey in Europe and we will see you soon here in Kokkola! 6 keys down and are ready for the advanced clinic! thing that you presented. You explained "why" something worked, "how"
Thanks for using a God given gift to help others. works. You were very eager to offer help. Again, I think the clinic was great and can't wait to attend another. quiet, controlled trail riding. We are having FUN!!! everything I would want in a perfect trail horse. The first trail ride after your clinic I observed a real change in him. He took the lead, crossed water without hesitation, moved a herd of calves who attempted to be aggressive with him, and did side passes to allow me to open gates, all confidently and quietly. The few times he might have spooked, he relied on my leadership to remain calm and keep his feet moving. God bless you and the work you are doing. Please click here to view our three page clinic host kit in pdf format. To download, right-click the link and "Save Link Target As..." to your hard drive. Please click here to download participant registration form.